Agenda 2030 and the SDGs are at the centre of discussions across all levels of government. Stakeholders are working hard to answer important questions on how to operationalise, how to track progress, and how to take leadership in order to inspire others for change. 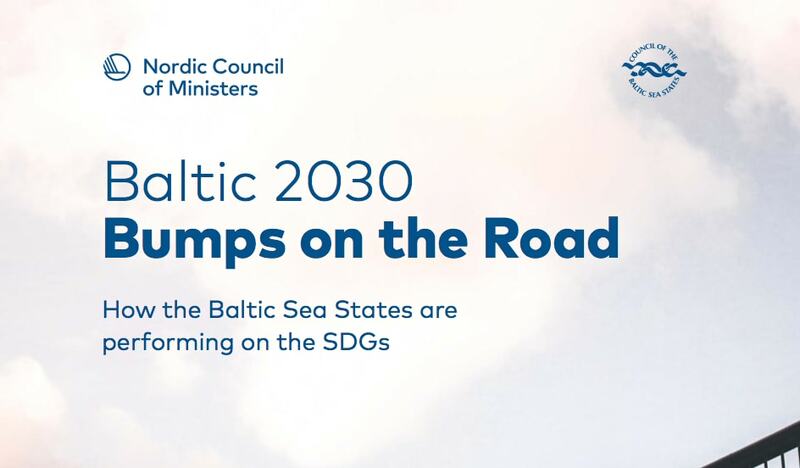 The Council of the Baltic Sea States (CBSS) and the Nordic Council of Ministers (NCM) are at the forefront of this work and have commissioned Nordic Sustainability of creating a report that analyses the state of SDG implementation in the region. Published at the Annual Forum of the EU Strategy for the Baltic Sea Region in Tallinn on June 5, the report ‘Baltic 2030: Bumps on the Road – How the Baltic Sea States are performing on the SDGs’ looks at the 11 Baltic Sea Region (BSR) countries and analyses their performance on the SDGs. Using data from the German Bertelsmann Foundation as a base, the report creates an overview of SDG implementation and looks at 5 SDGs at the indicator level in order to analyse where the problem areas are. It then proceeds to create recommendations based on these findings to recommend “Avenues for Action” to guide the organizations’ activities going forward. These propose increased regional collaboration, stronger involvement of youth for impact, improved sustainability reporting, much stronger focus on climate change and environmental goals, as well as work to reduce spillover effects. It was extremely rewarding to collaborate with the two organizations on this project and refreshing to see organizations that support the kind of realistic and open conversation that we think is needed for making real impact on this agenda, in the BSR and beyond.